If you find you have a never-ending supply of zucchini and your neighbors are no longer taking it, you might need to find some new and different recipes. Along with the standard quick bread and side dishes, zucchini makes an excellent addition to cakes and muffins, and it can be fried or pureed in soups. You can store shredded zucchini in the freezer to use in recipes throughout the year, or make relish, pickles, and chutney with it. Here are some of our favorite zucchini recipes. These flavorful little pancakes are made with fresh zucchini and Parmesan cheese, along with fresh or dried basil. Plan to let the shredded zucchini drain for an hour or two to get as much moisture out as possible. This sweet zucchini and green tomato relish is made with zucchini, green tomatoes, bell peppers, and onion, along with a variety of spices. This is a great relish for hot dogs or burgers, and it's an excellent way to use extra green tomatoes and zucchini. Taco seasoned ground beef makes the perfect filling for these zucchini squash boats. Top the stuffed zucchini off with some shredded cheese and taco sauce. Panko bread crumbs and Parmesan cheese make these baked zucchini fries crispy and delicious. You can use egg whites or egg substitute to keep the fat and calories to a minimum. These fries are a nice alternative to French fries, and they are great with sandwiches, burgers, or grilled steaks. Zucchini and tomatoes team up to make this great-tasting and simple side stewed zucchini dish. This is an excellent way to use your fresh zucchini, and it makes a fabulous dish to serve with a roast, fish, or chicken. The sliced zucchini is baked with parmesan cheese, basil, oregano, tomatoes, and other fresh ingredients. Zucchini parmesan is a great alternative to eggplant and it makes an excellent family meal or potluck dish. A cake mix makes this chocolate zucchini cake easy to prepare, and the shredded zucchini keeps it moist and delicious. This great tasting zucchini Bundt cake includes chocolate chips and chopped nuts. This favorite zucchini bread recipe includes cinnamon and chopped walnuts, and it makes 2 loaves. Use walnuts or pecans in this bread, and add some raisins or dried cranberries for a little extra flavor. These easy, savory quiche-style zucchini squares are made with eggs, bacon, and zucchini. They're a cinch to prepare and bake, and they make an excellent brunch side dish or party appetizer. Serve with tomato salsa or marinara sauce on the side for a fabulous snack or lunch. This simple combination of zucchini and yellow squash is a nice way to celebrate fresh summer vegetables. This zucchini and summer squash casserole makes a nice side dish with any meal, and it's super easy to put together. These zucchini muffins are made with shredded carrot and zucchini, along with cinnamon and brown sugar. These are delicious muffins, a great way to use zucchini. Add 1/2 cup of chopped nuts if you like. If you have a surplus of zucchini or summer squash, this is an excellent alternative to a loaf of zucchini bread or the ever-popular summer squash casserole. The natural combination of eggplant and zucchini is enhanced with tomatoes, cheese, and seasonings. The casserole is topped off with a buttery breadcrumb topping. These fried zucchini coins slices are deep fried with a Parmesan and panko breadcrumb coating. Serve with the simple sweet pepper dip for a delicious snack. This is a moist and delicious zucchini oatmeal cake, baked in a Bundt cake pan or rectangular pan. The spiced brown sugar cake is made with the addition of oats, zucchini, and chopped nuts. Serve this delicious chicken and zucchini with garlic cream sauce over hot cooked noodles, rice, or linguine. This delicious, nicely seasoned zucchini and tomato combination is baked with fontina or mozzarella cheese. This light and tasty zucchini soup is flavored with curry powder, a little carrot, and apples. 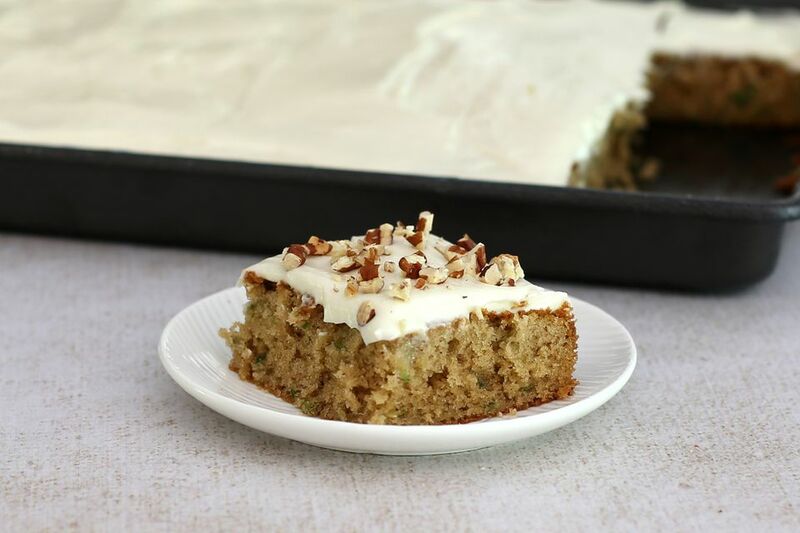 A carrot cake mix makes this fresh zucchini cake a snap to prepare and bake, and the addition of pineapple and optional coconut give it great flavor and texture. Whole wheat flour and applesauce provide extra texture and moistness to this flavorful spiced zucchini bread. The applesauce also helps to cut back on the oil in this bread. Serve this flavorful combination of vegetables with grilled, roasted, or broiled meat, fish, or poultry. Vegetables in this tasty ratatouille with eggplant and zucchini dish include eggplant, onion, tomatoes, and zucchini. Chicken breasts, tomatoes, and zucchini team up in a tasty Alfredo sauce in this chicken and zucchini skillet dish. Zucchini and tomatoes take on Creole flavors with a dash of Creole seasoning and the Holy Trinity of Cajun and Creole cuisine: onion, celery, and bell peppers. Yet another way to use freshly grated zucchini! These easy zucchini cookies are delicious and versatile. One reader suggested a simple icing for the cookies. Add chocolate chips or nuts. This easy moist zucchini cake is filled with shredded zucchini and chopped walnuts. Add a frosting or dust with powdered sugar. 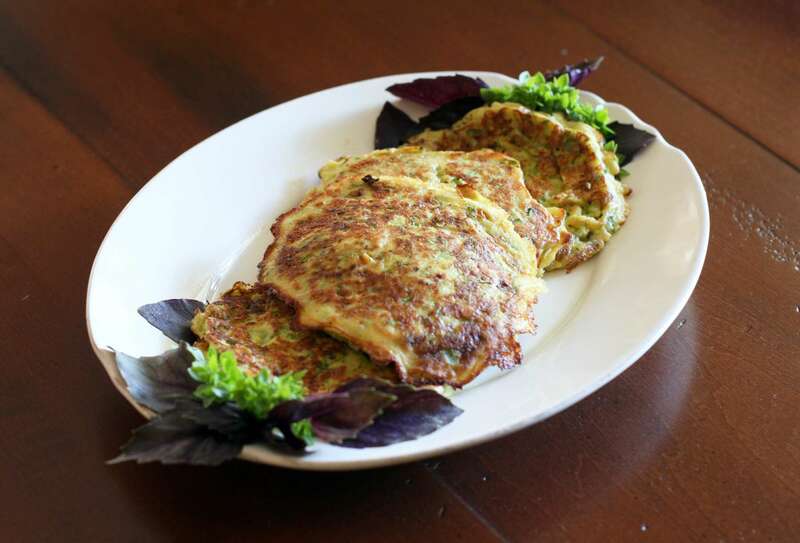 The batter for these easy zucchini patties is a snap to prepare. They are cooked like pancakes. This classic combination of zucchini and tomatoes is cooked in the slow cooker. It's an excellent way to use prolific fresh zucchini, whether from your garden or the market. This easy zucchini casserole with tomato sauce and bacon casserole is flavored with some bacon and a crunchy cracker and Parmesan cheese topping. Use tomato sauce or diced tomatoes in the casserole. Stuffing crumbs make up the topping for this tasty chicken zucchini casserole. This is an easy and tasty everyday family casserole. This zucchini gratin is made with a seasoned white sauce and a cheese and breadcrumb topping. Feel free to add bacon to the topping. These skillet pork chops are simmered with tomatoes, rice, and zucchini.